Ergo Monaco Universal Guest Chair. Fixed back height. 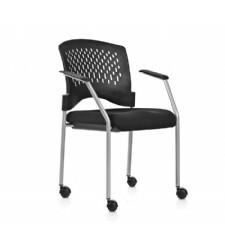 Molded foam black fabric seat. Contoured black plastic perforated back. Silver powder coated frame finish, Buides and casters both furnished with unit. 50mm nylon casters. Stackable, up to 4 high. Non-marring glides. Notes: Packed two (2) per carton, sold in sets of two . PRICE LISTED IS PER CHAIR! 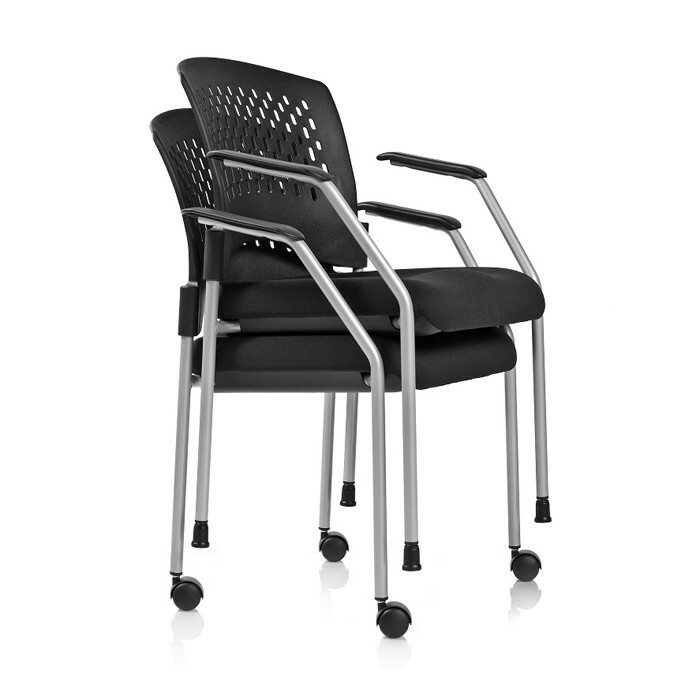 Our versatile Monaco seating collection provides superior comfort and style for your guests or employees. 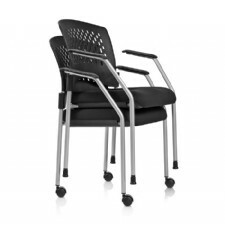 The Monaco Universal Guest Chair includes casters and glides to customize your needs. The Monaco Collection blends ultra-comfort, practicality and contemporary style. In addition to being an affordable stacking chair, glides and casters are furnished in the same kit as an added bonus. Training rooms, multipurpose rooms, meeting rooms, event rooms, work activity rooms, guest seating, informal break out rooms. ERGO Office Seating warrants that this product will be free from defects in its material and workmanship, as described below, foras long as the original purchaser owns the product. The company will repair or replace, at its option, without charge to the original purchaser only, defective products or parts from normal use. 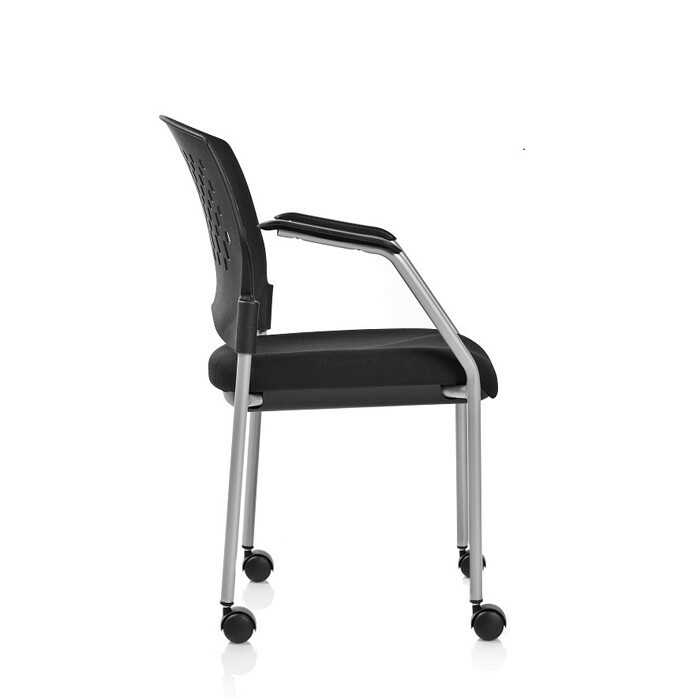 Lifetime Warranty which is the entire time owned by the original purchaser for all chair components including pneumatic cylinder, control mechanism, base, glides, casters, frames and other structural elements. Fabric Upholstery and Leather is warranted to the original purchaser for three years from date of purchase. This warranty shall be effective for the applicable time period starting from date of purchase as shown on your original receipt or other proof of purchase. This warranty is your sole remedy for product defects and excludes defects due to or arising in connection with product abuse or misuse, user modification of, or attachments to the product, including application of your own upholstery materials and products or parts not used, maintained or installed in accordance with the company™s installation, maintenance and/or applicable guidelines. Normal use consists of a standard 8 hour shift in a 5 day work week, and a 250 lbs weight capacity. We will repair or, at our option, replace the defective part, free of charge to the purchaser, provided that the purchaser returns said parts freight prepaid to our offices. Labor and service are not covered under this warranty. There are no other warranties, expressed or implied, other than those specifically described, including without limitation any implied warranty or merchantability or of fitness for a particular purpose. We will not be responsible for incidental or consequential damages. Some states do not allow the exclusion or limitation of incidental or consequential damages, so the above limitations or exclusions may not apply to you. This warranty gives you specific legal rights and you may have other rights which vary from state to state.